LF601S Lead Free* Silent Check Valves efficiently perform all of the functions of a swing check or vertical lift check valve and at the same time operate silently to prevent the effects of water hammer. The Series LF601S silent check valves feature Lead Free* construction to comply with Lead Free* installation requirements. A Lead Free* silent check valve shall be installed as indicated on the plans. The valve shall have a Viton® disc, integral Lead Free* copper silicon alloy seat and silent operation. Pressure rating no less than 400psi (27.6 bar) WOG non-shock. The silent check valve shall be constructed using Lead Free* cast copper silicon alloy body and check with Lead Free* brass adapter. Lead Free* silent check valves shall comply with state codes and standards, where applicable, requiring reduced lead content. 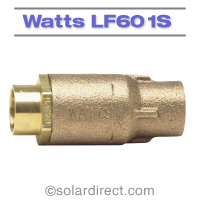 Valve shall be a Watts Series LF601 (threaded) or LF601S (solder). NOTICE These valves are not suggested for installation in sewage ejector piping. Do not use for reciprocating air compressor service. * The wetted surface of this product contacted by consumable water contains less than 0.25% of lead by weight.